I promised to let you know about the gift card (see my 16 December post). It has arrived. £10 and a night out with a cashier of my choice? No. One year's supply of Sapphire grapes and afternoon tea with the manager? No. A fiver - which I will be donating to charity. Readers of Breaking Law will know of my price label experiences with supermarkets and how the consumer stands legally. Peel away with my latest little battle. As your records may disclose, I have felt it neccessary in the recent past to make several complaints to you regarding pricing issues at your Richmond-upon-Thames store. I regret it is a case of ‘here we go again’. 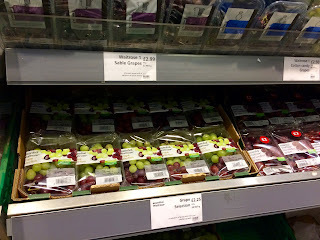 Below you will see a snap of yesterday’s grape display at the store. 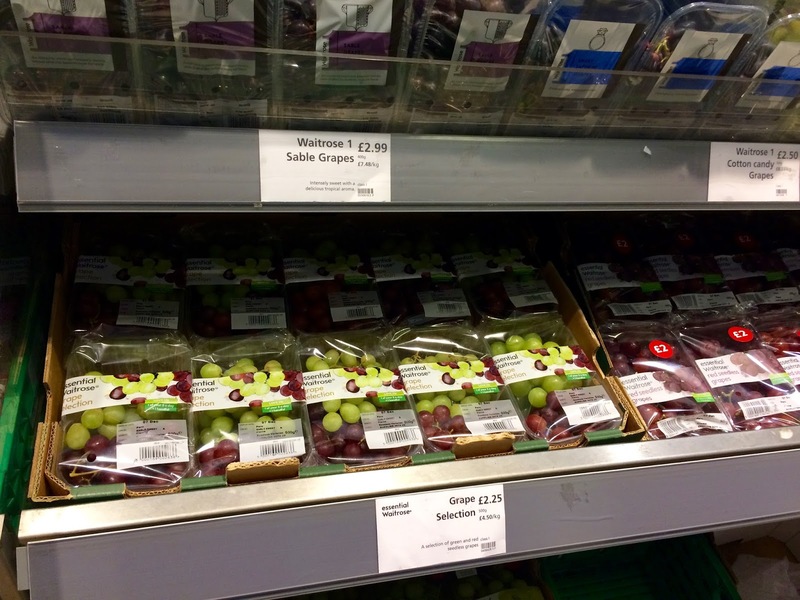 On the upper shelf, three kinds of grapes are displayed - sable, sapphire and cotton candy. There are price notices for the sable and cotton candy but not for the sapphire. The absence of a sapphire notice creates a misleading situation as customers would be forgiven when they select what are sapphire grapes for believing they are sable or cotton candy. This would probably result not only in them getting the wrong kind of grape but paying more than they intended as I gather that you intend charging £3.29 per carton for the sapphires as against the cheaper £2.99 or £2.50 (as the case may be). The display depicted by the snap has been the state of the grape display at the store for about three weeks! Would it help if I made a sapphire price notice for you and came and affixed it at what would be the correct position? Thank you for your patience while I looked into this Stephen. I have a had a response from the branch regarding the ticketing on our grapes in our Richmond branch. The duty manager has assured me he has spot checked the fixture and can confirm there is a ticket for each product. He has advised that the sweet sapphire ticket that was missing has a date for 5/12/16 on, so was printed the following day. The duty manager would like to apologies for any confusion and disappointment caused and is more than happy to discuss this with you when you are next in branch. I hope my response has been helpful today and if you’d like to provide feedback, please click on the link below. Thank you for your message. I think that what you are saying is that, after a period of about three weeks with no price ticket for the sapphire grapes, one was printed out the day after and as a result of my communication to you. Is that correct and do you accept that this latest lapse is very serious? Further, are you prepared to bring the lapse to the attention of your customers in an appropriate way and inform that, if they have been misled into paying more than they intended for the sapphire grapes, you will make reimbursement to them? Surely this is the very minimum action you should take? I will not trouble the duty manager when next in the store in case he feels constrained to project a large grapefruit in my direction! Thanks for getting back in touch Stephen. Unfortunately I'm unable to comment about the last few weeks, however I can confirm that the branch periodically check our products to ensure the correct ticket is being displayed. Sometimes mistakes do happen which appears to have been the case on this occasion. The branch do always welcome any comments or feedback from our customers, if you have any problems in the future please do speak to a Partner at the time and they'll be pleased to resolve this for you. Thank you but, if I may dare to suggest it, you are avoiding giving me any specific answers to the specific questions I posed. Given that I appear to have been responsible for bringing an end to a misleading state of affairs, I think you should at least favour me with those answers. Thanks for your return email, although I'm sorry you remain unhappy with Kelsey's response. We do everything we can to make sure all our prices are clear on shelf edge tickets and have rigorous procedures for checking that our prices are correct. We certainly don’t intend to mislead our customers in any way. In this instance it would seem to be a case of human error on this occasion for which we apologise. I'm sorry you had a disappointing experience at Waitrose. To say sorry, I'd like to send you a gift card. Please could you reply to confirm your full postal address and I'll arrange this for you. I hope we can look forward to seeing you again soon. Thank you for your message. Let me make it clear. I am not saying I was deceived and, save to the extent that I have suffered the frustration of not getting you to give straightforward (or any) answers to straightforward questions, I have not suffered on this occasion anything that could be categorised as a loss. However, if you remain insistent on sending me a gift card, I will not look a gift horse (or card) in the mouth and provide my address below but you may wish to reconsider. My concern is for those who have been deceived. What are you going to do about it? I have already made a suggestion. Come on, answer that please and no more evasion. I'm sorry you feel that I have evaded your query that was certainly not my intention. If any of our customers come forward and make a complaint of a similar ilk then we would of course compensate them for that. I have arranged for the gift card to be sent to you. You should receive this within the next couple of days. I will let you known when the gift card arrives. I may be able to buy a couple of bunches of grapes with it, at least. Yes, I still shop at Waitrose. That free newspaper deal on a £10 spend is a good one! "Hi, long queue here this morning. Did you have a good Christmas?" "To return this. It's stained, chipped and leaks." "Do you have the receipt?" "No, of course not. I expected it to be ok when I bought it. It came in a box. I screwed up the receipt and dropped it in the gutter." "I can't do anything without a receipt. It's part of our returns policy. Look it says so in great big red letters on the wall behind me." "But I'm not relying on your returns policy. I'm relying on the Consumer Rights Act. " "I still can't do anything without a receipt. You could have bought this anywhere." "Do you accept I am man of truth and honesty?" "errrrrr, I suppose so. Yes." "Then as a man of truth and honesty I am telling you that I bought this product on the 14 December 2016, from this shop, in cash for £29 and it's rubbish." "Shop policy is no receipt, no redress." " And my policy is to sue when the shop is in the wrong and it doesn't know what it's talking about. There's no law which compels me to produce a receipt when I have a valid claim. My word can be accepted. If you continue to be ridiculous, I will make an on-line claim against your company for the £29, my expenses in coming here today and getting back home, the expense of sourcing a replacement product and any extra I have to pay for it, interest on all this money at 8% and the court fee. Such a waste of time. Such a pity." "Wait there. I'll get the manager." To members of queue behind now numbering 137 people. "I do apologise that you are having to wait. Was your Christmas pleasant?" Before you blow a fuse, new rules laid before Parliament today and explained below will not generally affect cases listed for trial before 6 March 2017. When a civil claim is listed for trial, you the claimant will have to pay a hearing fee (which you will probably get back from your opponent if you win). But we are talking about potentially big money. For a small claim, it will range from £25 to £335, depending on how much you are after. On a fast track claim it will be £545 and for a multi-track claim ,,,,,,,,(wait for it)......£1,090. The fee will probably be payable quite a while before the actual trial takes place. However, to encourage settlements, there is a refund system. The earlier any settlement takes place, the stronger the chance that you will qualify for a refund. On a small claim, for example, you will get back the entire hearing fee if you have notified the court in writing at least one clear week before the final hearing that there has been a settlement or that you are abandoning the claim. Forget this scheme for the future. Under the new scheme coming in next year, you will be able to hold on before paying the hearing fee until four weeks before the trial but the refund system will be abolished. This means that if you have brought a small claim and settled rather late, you will be worse off under the new scheme. There is an exception in all cases where the trial date is not notified earlier than five weeks or less beforehand. Then, the hearing fee will only have to be paid within one week of notification of the date. I was in on Monday when I bought a chamber pot for Aunt Madge and you unreasonably refused to mark the receipt to the effect that it was a gift for her and that she should exercise all my consumer rights as a third party. I let the public know about my visit in my post of 5 December 2016. As much as it irked me to do so, I still bought the pot because it was in Aunt Madge's favourite colour of pink and I could not get that colour anywhere else. I won't tell you the colour they had it in next door! Anyway, I have looked up the law in Breaking Law by my new best friend Stephen Gold and I can get round your obstinacy. I have delivered the pot early to Aunt Madge with a card in which I have assigned my rights. So I require you to take this letter as formal notice that by my card to her dated 7 December 2016 I have assigned to Aunt Madge of 106b Acacia Avenue, Twickenham all my rights and remedies under the Consumer Rights Act 2015 and otherwise in the contract for the purchase of the pot. This means that legally she steps into my shoes although she in fact wears a size 4 court shoe and not hobnail boots. So put that in your till and smoke it! Merry Christmas. "Good Afternoon to you. I wish to purchase this computer for £150. I will be paying £5 on my credit card and £145 in cash." "Are you getting me at it, sir? You were in on Monday making a ruddy nuisance of yourself. I suppose this is another of your jokes." "I am deadly serious. You see, if I pay for any purchase by credit card then so long as the cash price was more than £100 for that one item, the credit card people are equally responsible as you if it falls to pieces in January or you go out of business before it's delivered to me. It makes no difference that only a small proportion of the price is on my card. The credit card company would be just as liable as if the entire price had gone on my card. And I can choose just to make my claim against them. I don't even have to bother with you. It's in section 75 of the Consumer Credit Act 1974 and that amazing book Breaking Law." "Don't you mention that book in here. The boss will do his nut. Must say though, it sounds like a brilliant idea. I might do it myself when I go shopping." "For cheaper purchases you can get some protection using most credit, debit and charge cards. Amex, Visa and MasterCard are included but it's nowhere as useful as what I've been talking about. Anyway, there are 70 people behind me in the queue so don't waste any more of my time or theirs." "I am busy. Are you buying this or not?" "On one condition. It's a gift to Auntie Madge Moody. If it falls to pieces, I want her to be able to follow up a complaint and, if she wishes, to reject the thing. It would be embarrassing for her to have to come back to me to do it for her. I can't have you telling her to go away because she was not a party to the contract. So please write on the receipt "This is a gift for third party Auntie Madge Moody. We agree she shall have all the rights and remedies in law which our customer has." Do that and I'll buy." "I'll just fetch the manager." You'll find much more in Breaking Law. Some of my best friends are tax inspectors but I am duty bound to report another tax tribunal loss by the Inland Revenue (or Her Majesty's Revenue and Customs when I am in the presence of a tax inspector). I told in my 17 November 2016 post (see Blaming Your Accountant) how a taxpayer who reasonably relied on their accountant for advice might be able to get a tax penalty quashed which was imposed because of a mistake for which the accountant was negligently responsible. In the case of which details have just been published, the taxpayer had made several mistakes in his tax return which were down to him and his own carelessness. As a result, he underpaid nearly £19,000 and the Revenue decided to penalise him for that carelessness in the sum of close on £3,000. Another taxpayer ouch! But he did more than feel the pain. He appealed to the tax tribunal. The Revenue has power to suspend a penalty for a careless inaccuracy if it sets conditions for the taxpayer to comply with provided the conditions would help the taxpayer avoid history repeating itself. A sort of suspended sentence and if the conditions are complied with over a maximum period of two years then that will see the end of the penalty. In the tribunal case, the Revenue had followed its internal guidelines and wrongly concluded that the purpose of the statutory power to suspend - you will find it in paragraph 14 of schedule 24 to the Finance Act 2007 if you want to read it up in bed tonight - was specifically to see the taxpayer's record keeping systems corrected. In fact there was a very much wider purpose which was to enable the taxpayer to produce returns which were free from careless errors. The Tribunal overruled the Revenue and suspended the penalty on condition that the taxpayer retained a qualified tax adviser to assist in the completion and submission of returns for two years and that that the adviser provided him with checklists and post return checks. If you have just escaped from the car park at Waitrose, Richmond without paying, you can thank me. The clock at the entry and exit machines was around 30 minutes out. Waitrose say it was only 10 minutes out. My case, Your Honour, is that I entered at around 11.40 am whereas the time printed on the ticket was 11.10 am. When I inserted the ticket in the pay machine at 2.11 pm as a test, it asked for a penalty payment of £25 because, according to its clock, I was over the three hour stay limit. Waitrose accepted that there was a problem and put an engineer on the job. When I pressed my complaint on behalf of customers who might be misled into paying more than they should, they put the barrier up at the exit point and posted a staff member at the pay point with a view (hopefully) to warning customers not to pay. It's wise not to rely on your watch to log the correct time when you leave your car but to check what the ticket would have you believe is the correct time or you could be caught out. For anyone who, whenever and wherever, is caught out in this sort of situation, you will find the wording for a court claim in Breaking Law. Oh and Waitrose let me out without paying anything. It must be my smiley face. "Hello, sorry to pull you away from talking to your friend but I was thinking of buying this laptop. Trouble is I gather from Breaking Law that I only have 30 days for short-term rejection and after that I could be saddled with a replacement or repair. It might go wonky after the one month. I'll buy it though if you will agree to extend my time for short-term rejection to say three months and write on the till receipt or invoice that you do agree." "I'll just get the manager, sir. And sorry to have kept you waiting but I haven't seen my friend for ages and she has just had a baby."